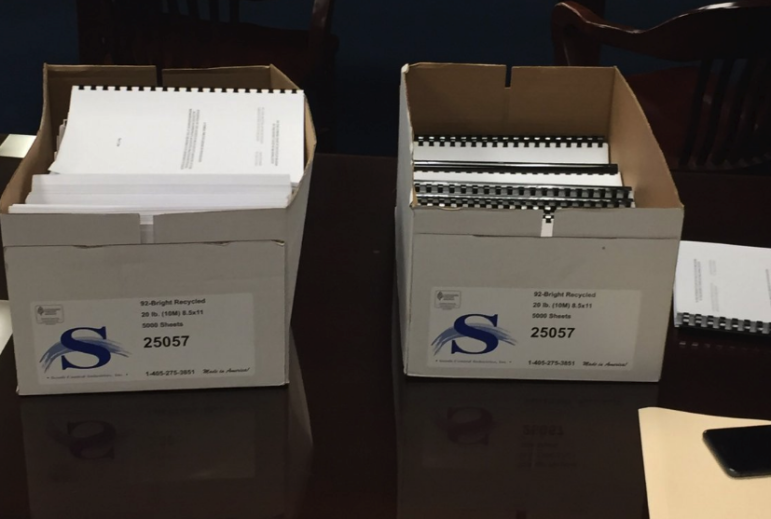 These boxes contain the documents of the grand jury report on its probe into the Oklahoma State Department of Health financial crisis. The grand jury said no federal or state money was embezzled and it didn’t uncover evidence that any former managers at the agency personally benefited from the activities. Mismanagement allegations at the health department first publicly surfaced in September as the agency announced furloughs and cuts to contracts just months into the new fiscal year. By late October, Health Commissioner Terry Cline and his top deputy, Julie Cox-Kain, had resigned along with Felesha Scanlan, business planning director. Those resignations kicked off a tumultuous series of events that included job cuts, loss of funds for child-abuse prevention programs, multiple investigations by state and federal agencies and the $30 million emergency appropriation by the Legislature in November. But from the grand jury report and the investigative audit, it appears none of those actions were needed. Q: Why were no criminal indictments handed up by the grand jury? In short, because there was no money missing or embezzled. The cash crunch the agency appeared to have found itself in was because top accounting employees thought they couldn’t spend a certain class of money called restricted funds on other agency purposes. The agency did come close to running out of money, but only because its internal accounting system was so old and complicated that nobody inside the agency had a good picture of all the finances. Q: What will happen to the almost 200 health department employees who lost their jobs? It’s too early to say. Most of the positions were eliminated, so it’s not just a case of bringing them back to work. And some may not even want to come back to an agency that still has a lot of work to do toward fixing its financial problems. Aside from the 200 layoffs, others have retired or left the agency for other jobs since news broke of the scandal. The health department now has about 1,600 employees, down from 2,000 in October. Sterling Zearley, executive director of the Oklahoma Public Employees Association, said he was very surprised by the report’s findings. His association plans to meet soon with interim Health Commissioner Tom Bates to see what options might be available for former agency employees. Their severance packages may have to be paid back on a prorated basis if they go back to work for the health department, Zearley said. Q: Did the grand jury think state laws on embezzlement and mismanagement are too narrow? Yes. In its report, the grand jury said it was “lamentable” there was no criminal statute covering the “mismanagement, deception and obfuscation” at the health department. It recommended the Legislature look at existing criminal statutes and consider adding a section that would cover what went on at the health department. Q: What happens to the $30 million in extra funding the health department got from the legislature? The grand jury said it should be used for additional performance and investigative audits to uncover possible fraud, misuse and mismanagement at other state agencies. It also recommended the legislature mandate regular performance audits at state agencies. Of course, it will be up to the legislature on how it wants to spend the $30 million if it requires the health department to return the money. Q: How bad is the health department’s internal financial system? It still works, but barely. The agency’s internal system, called FISCAL, dates to 1982 and is only accessible via text-based commands through a system that is no longer supported. Replacement parts for the system have been bought from foreign countries because they can’t be found in the United States. The health department’s system doesn’t communicate or synchronize with the state’s financial program, called CORE, which is maintained by the Office of Management and Enterprise Services. “As a result, the department’s reliance on an antiquated and ineffective accounting system internal to the OSDH failed to accurately depict the financial position of the department,” the grand jury report said. The grand jury recommended the health department move to the state’s CORE system and use some of the money it already has from its “slush fund” to pay the costs for that move. Q: What’s next for the health department and the Board of Health? Interim Health Commissioner Tom Bates took over in March and has been meeting with employees and leaders at partner agencies. Bates is a former assistant attorney general and most recently was a special advisor to Gov. Mary Fallin focusing on the implementation of a court-mandated improvement plan at the Department of Human Services. The health department didn’t initially comment on the report and audit, saying it wanted to review them. But the agency issued a statement late Friday where Bates expressed regret at the unnecessary job cuts. Bates said the health department is still looking for a permanent chief financial officer and controller, but it has been difficult to attract candidates amid the agency’s financial difficulties. He also said the health department had 231 additional resignations since last October and is looking to fill several positions, including nurse surveyors to help inspect nursing homes and other care facilities. In addition, Bates said the agency is crafting its budget for fiscal year 2019, which starts July 1. The Legislature appropriated $54.8 million to the health department for FY 2019, a 4 percent increase from 2018. A new law, House Bill 3036, makes the health commissioner a direct appointee of the governor. It also strips power from the Board of Health and makes it an advisory body. The board has nine members who serve for nine-year terms. They are appointed by the governor and confirmed by the Senate. The new law takes effect in January. Q: Who didn’t testify before the grand jury? Q: How did the “slush fund” work? The investigative audit performed by Auditor and Inspector Gary Jones explains how the health department managed to build up a “slush fund” to conceal money from the legislature and its own financial department. It’s complicated, but because the agency receives federal grants, state appropriations and county tax revenue for its funding, its employees are paid from several different sources depending on their job function. Some employees, especially those at county health departments, spend their time on several different programs. The health department estimated those program expenses ahead of time and reconciled the actual hours worked on each program at a later date. Any excess funds that were above the estimate for an employee’s “Time and Effort” report were put into a special account in the health department’s internal financial system, called FISCAL. That fund was labeled “Program Funds Recovered,” or 410H, and was given a 400-level account designation normally used for federal funds. Another “slush fund” was created from the agency’s revolving funds. The fund, 210H, received fee money from vital records (birth and death certificates) and some administrative fees from other programs. By setting up the 410H slush fund, the agency effectively stopped the legislature from “sweeping” the account when it needed to calculate the agency’s appropriation for the next fiscal year. Q: What did the grand jury find about the “front-loading” of contracts between the health department and the Tobacco Settlement Endowment Trust and the University of Oklahoma Health Sciences Center? The TSET contracts date to 2011 and were to start the Certified Health Community grant program, which the legislature later expanded to schools. The health department sent a total of $8.5 million to TSET in several payments in 2011. Some of that money was used on the programs, but TSET still held more than $4 million for the programs by the time the health department hit its cash crisis in the fall of 2017. Similarly, the health department signed a $1.5 million “upfront” contract with OU Health Sciences Center in 2011 to recruit, train and educate minority students in public health. About $400,000 was spent on that program, with $1.1 million returned to the health department. The grand jury report said $9 million of the $10 million for the TSET and OUHSC contracts came from the health department’s “slush fund.” It said the agency didn’t use state appropriations for the Healthy Communities and Healthy Schools program, as mandated by the legislature. “It does not appear that federal funds were used inappropriately, nor does it appear that funds were used for a non-health related purpose, but the programs were funded in a manner not conforming to state law,” the report said. Dec. 10: Where Were the Watchdogs in the Health Department Crisis?